The numbers have been moved to the center panel that has the I Spy/novelty fabric. 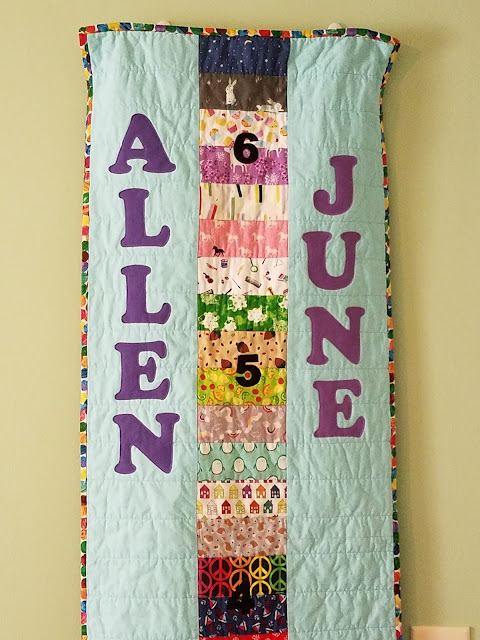 I still like it better on the solid background so the numbers don't compete or blend into the fun fabrics, but it was well worth the relocation to get both kids' names in. Other than that change, I used the same method & measurements for this chart that I did when making my son's. I combined this Moda Bake Shop tutorial by Vanessa from the Craft Gemini, with this picture of charts made for twin boys, which were based on this picture and I rolled them all into something that works for me. 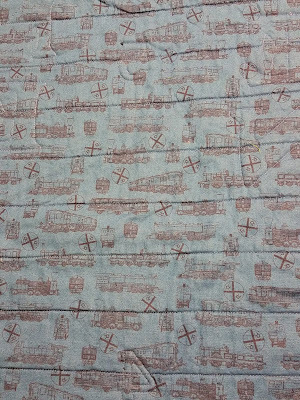 My friend picked out the background fabric when we were fabric shopping together, it's Kona Robin Egg. She told me to ask her son (age 3 at the time) what colors to use for the names and if they should be the same or different. His favorite color is purple and he wanted them both to be purple but different shades. His name is in Bright Periwinkle and his sister's name is Morning Glory, both scraps that I had. The numbers are Black. I used some Very Hungry Caterpillar dots for the binding and really like how that looks. 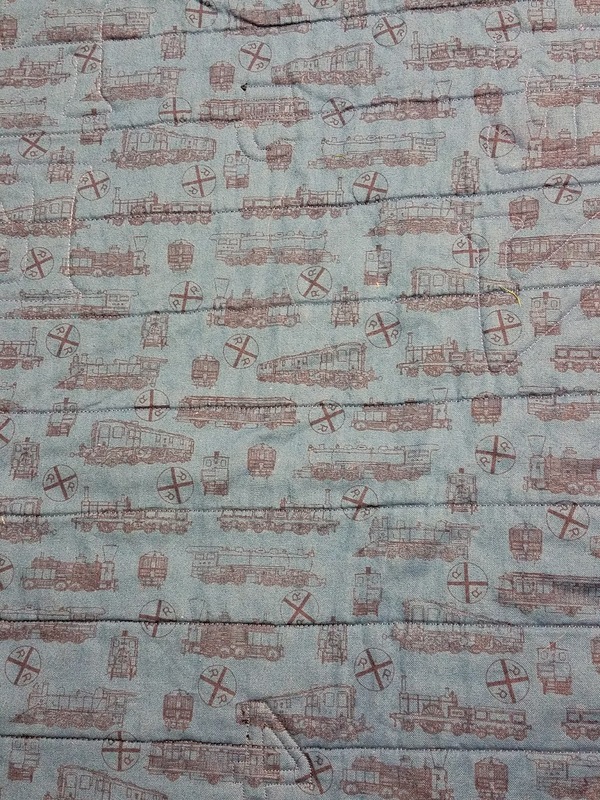 The back is a blue train print because he is absolutely crazy about trains and I happened to have a good bit of this. This was #1 on my list of Q1 goals for the globally-hosted Finish Along. I like the idea of using the growth chart for both the kids. It will be a good way to compare the growths. And making a quilt makes it portable too! What a great idea, love this. I bought one to make years ago but it is languishing in the box of panels which includes about fifteen advent calendars. Yours is so personalised and includes the interests if the children, really like it, now I'm thinking of making one for my granddaughter, but it will have to include princesses of course. You are coming right along with finishing those UFOs and working on your 2018 goals. I love your Merry QAL quilt. I sure hope some of your motivation rubs off on me. I've been working on your bookshelf block. It's taken me over 8 hours already! I'm lovin' it. It will be different...no more hints. A very fun finish! Congrats on being on track with your 2018 goals. Great growth chart! Your niece is very lucky. Such a clever and beautiful project. Congratulations on behalf of the 2018 FAL hosts and thanks for linking up.